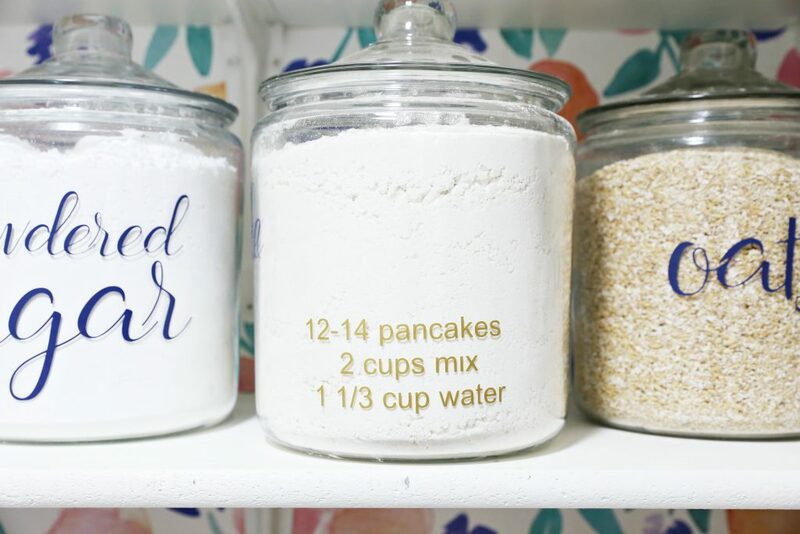 It’s finally time to reveal my pantry makeover and share our favorite Pantry organization ideas. It’s been a work in progress but I’m SO beyond thrilled that it’s done! Mallory came over and we worked together to create a completely pantry organization system. I have a pretty good size pantry which is a huge change from our old house’s pantry which was basically a few shelves tucked into our laundry room. I’ve been dreaming of space for food for our family of 6 and have been brainstorming pantry organization ideas for seriously forever! What is your biggest challenge when you are trying to organize a space? When I am struggling with organizing a space I want the space to function for me and my family. Which means the way I organize may not be exactly what works best for your family. I have found that when everything is labeled it makes my life so much easier and it easy for my family to help me keep it organized. If I don’t label where everything goes then it may stay organized for a little bit but in the long run it won’t stay organized. Now that I know what I need to do to get organized and stayed organized now it’s time to make it look pretty. When I started with organizing my pantry I knew that the space that I would walk into several times a day. Just like my laundry room, I wanted this space to be pretty and make me happy. In small spaces like my laundry room, Mallory’s laundry room, Mallory’s pantry, and my half bathroom we like to use a bold pattern and small color when we are designing a space. I decided early on that I wanted a fun and bold wallpaper in my pantry. I was on the search for a great wallpaper. You can find some of our favorite wallpapers HERE. Before I go into designing the pantry this is what the pantry looked like when I moved in. 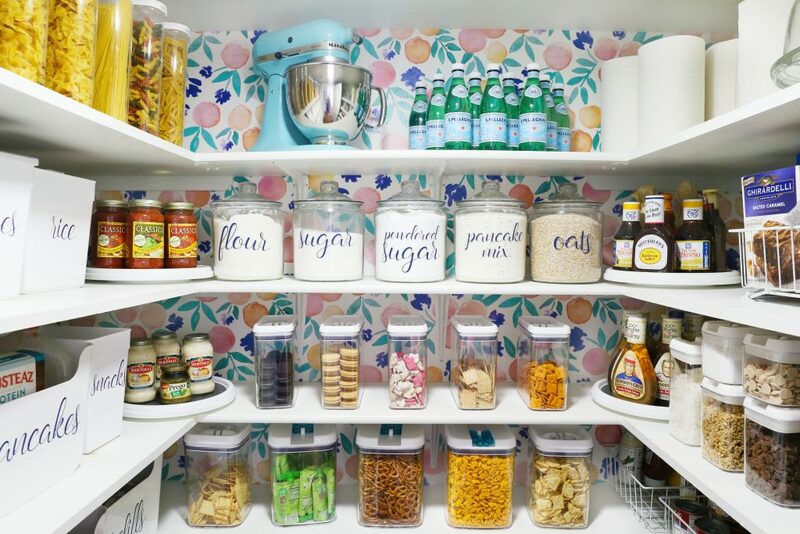 This wallpaper in my pantry makeover changed everything. It completely inspired my entire design for this space. I am so in love with it. When I was designing my pantry I was really inspired by Mallory’s old pantry that you cab see HERE. I love that she had super bright colors and that the back accent wall really made everything pop in the pantry. I was in search for the perfect wallpaper for this space. I have really love for the designer Caitlin Wilson. She is so inspiring and I love everything that she has every designed. I love that she loves color and she uses color in perfect ways. Her wallpapers are just all so amazing. I also love that her wallpaper is pre-pasted which makes install really easy. The wallpaper that was really catching my eye was the Summer Citrus Wallpaper. This wallpaper was the perfect pop of color that I was looking for. I also love that it was a citrus pattern and from the second I saw it I knew it was perfect. I order two double rolls and was really excited the day the wallpaper arrived. It was even better in real life. Although, I have wallpaper before with this project I decided to have someone come in and do the wallpaper. On install day I was beyond excited. The wallpaper is perfection and worth every penny! My biggest issues with my pantry is that I have a good size of pantry but none of it was working right for us and the space was not being use to it potential. Thats where the bins and jars come in. These glass bins that we are using can be found in many different stores and online. I used the 1 gallon jars for my flour, sugar, powder sugar, coaches oats and also pancake mix. I love putting these items in jars because it is easier for me to see how much of these products that I still have and I also use these products a lot. I have been asked how do you know my food is going bad? I write on the back of my jars the expiration with a permanent marker. When the date changes then I use nail polish remover. 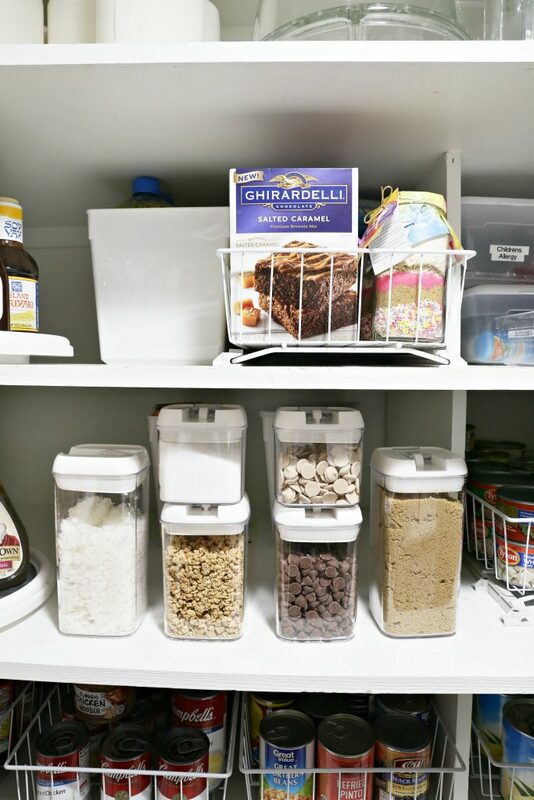 These cereal bins are our favorite bins for cereals and snacks. We love these bins because they fit a whole box of cereal. We also love these bins because they have a sealed lid. I also used these bins for some brown sugar, powder sugar, chocolate chips and caramel chips. For the pasta bins I used the tall clear bins with the snap on lids from Ikea. All the different pastas have different cooking time so I used a black permanent marker to write the time on the back of the bin. This makes my life so much easier. We have used these bins in so many different projects. 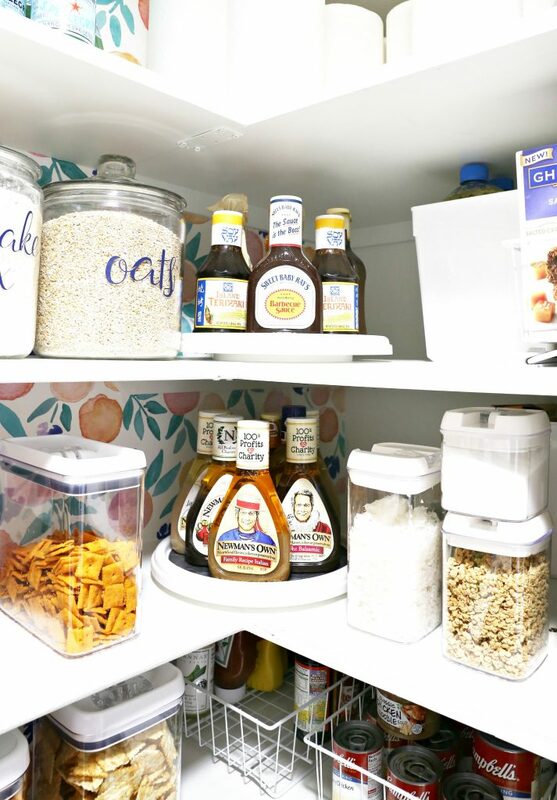 Mallory used the white bins in this pantry makeover. 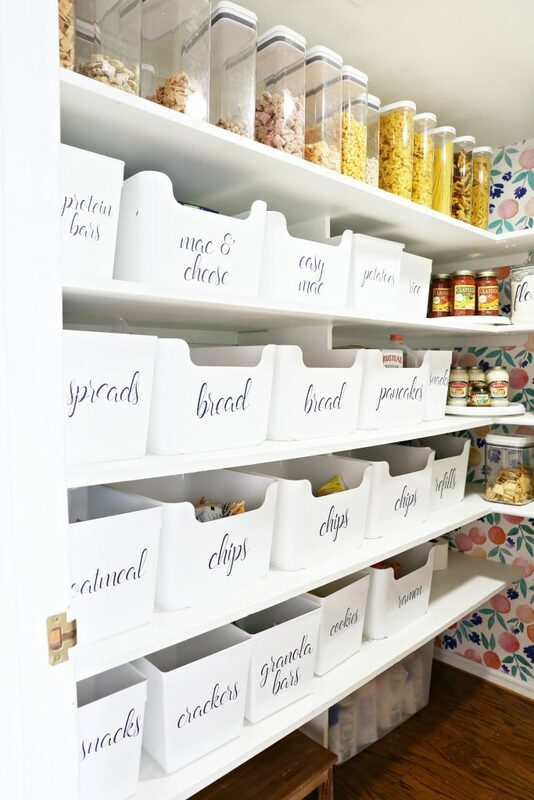 I love these bins because you can use in all different organizing projects. We found the white organizing bins from Ikea. 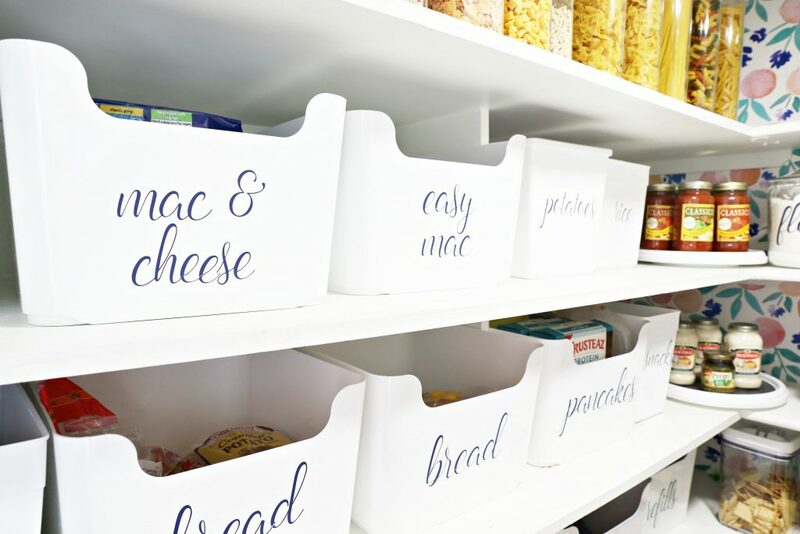 We love these white organizing bins because they hold a lot of items and they look really clean and neat. We used many different sizes of bins from the PLUGGIS line at Ikea. These ones are my favorite size. For the labels on these bins and also the jars we used the Silhouette Cameo machine to make our own vinyl labels. 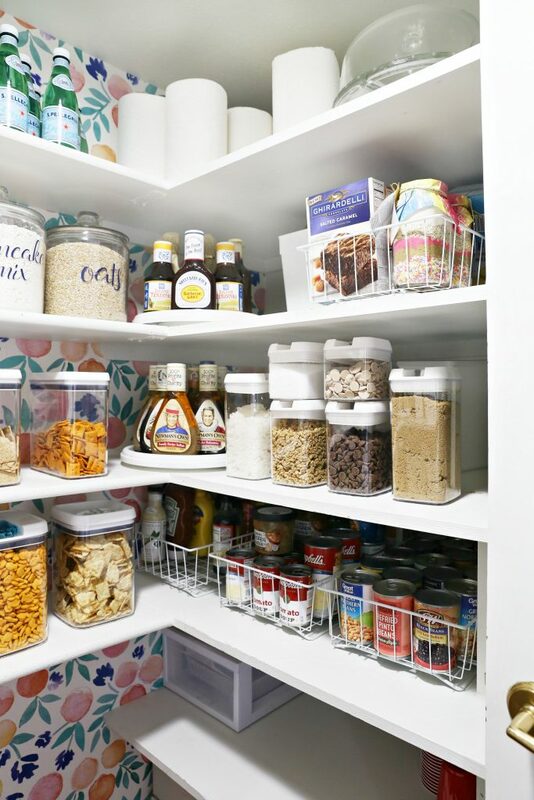 I used lazy susan in my pantry because in the corners of my pantry I had wasted space. I also had different jars and dressing and sauces. 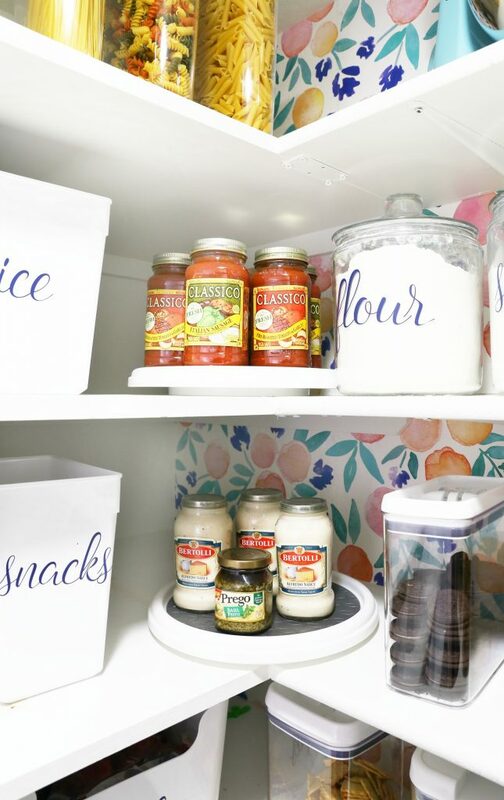 By using the lazy susan I was able to maximize the space in my pantry. In this pantry I used four 12 inch white lazy susan. I have found several different lazy susan from many different places. For my pantry I used 12 inch lazy susan and I found them at Walmart. When we moved into our house the wire drawers were already in the pantry. I have liked these wire baskets for a long time. 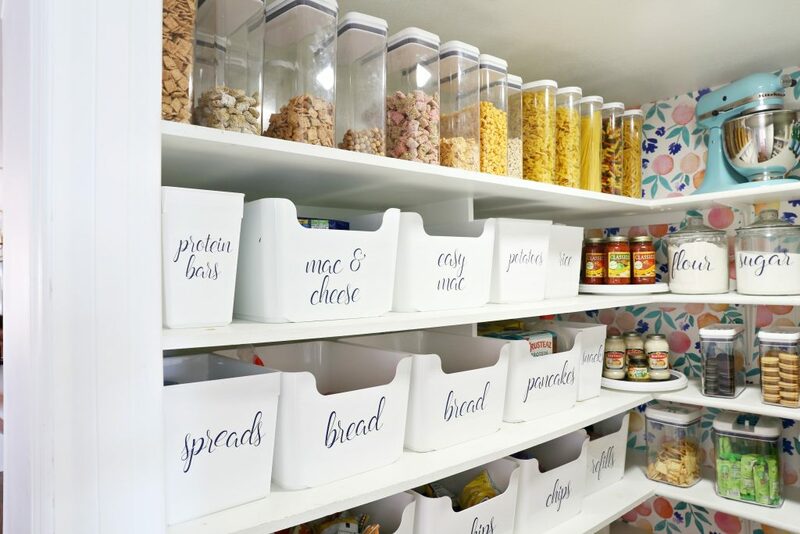 I did change out of the wire baskets with bins because I like the look of the white bins and I also was able to maximize the space in my pantry. For my medicine I like to break down what I use my medicine for. I have a first aid bin, allergy, cold, and so on. For these bins I wanted bins that had lids on them and I put them on a upper shelf. The bins I used for these are really cheap and they are a bin that could be used in my different organizing projects. We also used the bins HERE. I storage a lot of my food storage in my pantry. I store it all on the very bottom shelf. I love having a step stool in my pantry. In my pantry some of the shelves are not big enough for the cereal bins. Because the shelves are not big enough I have to put those bins on the top shelf. Before I started to organize my pantry and even before I bought even my bins I did a massive grocery order. I order all my groceries online from either Walmart groceries to go or Fry’s Click list. I love ordering my groceries because I don’t just buy what I see, I buy what I need. I actually even save money by do it. What to do if you don’t have a pantry? 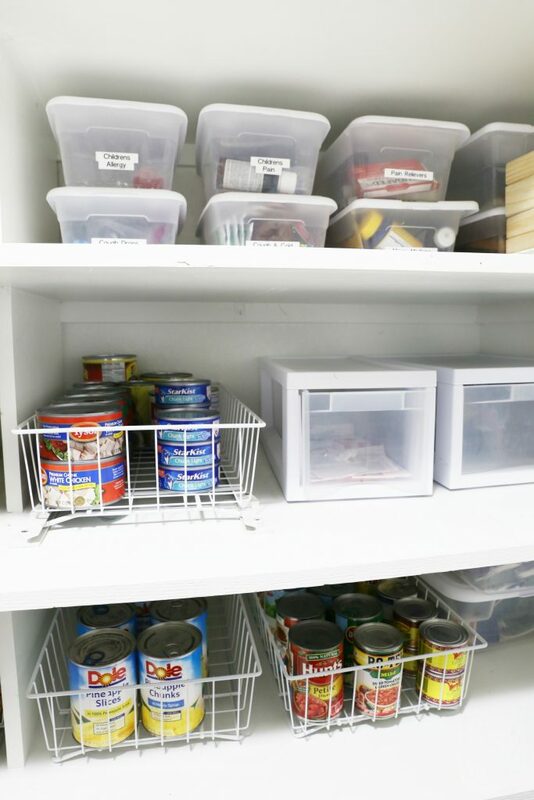 If you don’t have a pantry and you need somewhere to store you canned food? Check out this awesome Canned Food Storage Unit. I love my pantry and love everything about it! My favorite part is for real the wallpaper. I love this space and it makes my heart so happy every single time I go into the space. 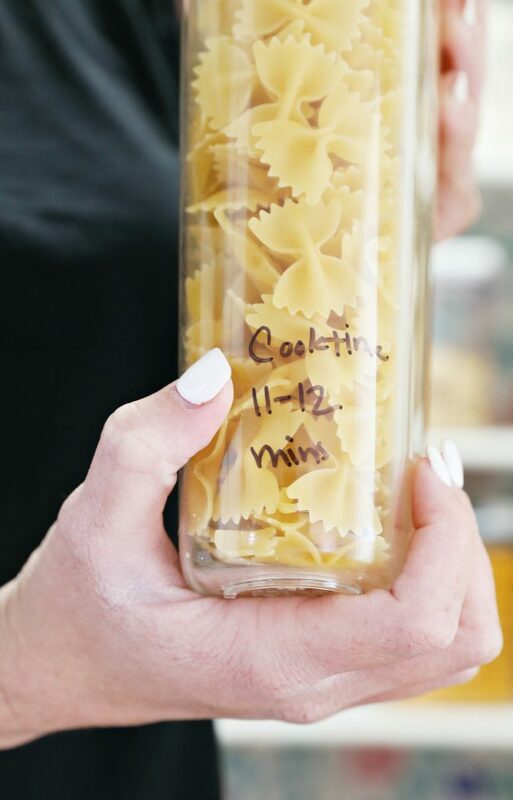 Favorite things: permanent marker tip for expiration date and cooking times. Also links to all the bins and containers. Thanks! Love this so much! I think I am going to tackle mine after Easter!! And by the way….I also LOVE the wallpaper! 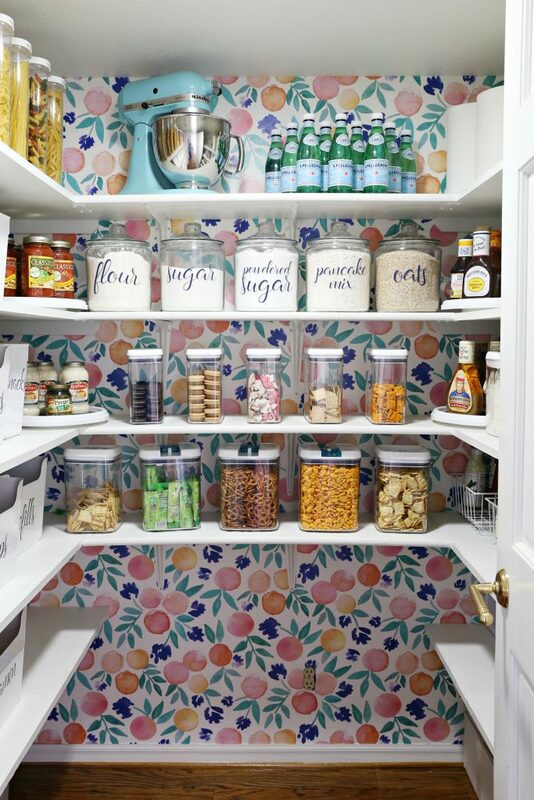 This looks great but you know it’s funny because I thought that a busy wallpaper would make a pantry look cluttered but it actually looks amazing! Online, everyone has these beautiful kitchen cabinet/pantry photos. The jars are never empty, and I never see where the “next in line” to go into the jar is? Or the odd size where you accidentally have some left over. Where is the box of Cheez Its in line to go into the jar? I enjoy your blog, but do remind myself that personally, for our family, the photos in the post are not conducive to our real life…. Loving your pantry way too much. Thx for all the links… such an inspiration. What font did you use on your labels? Thank you! 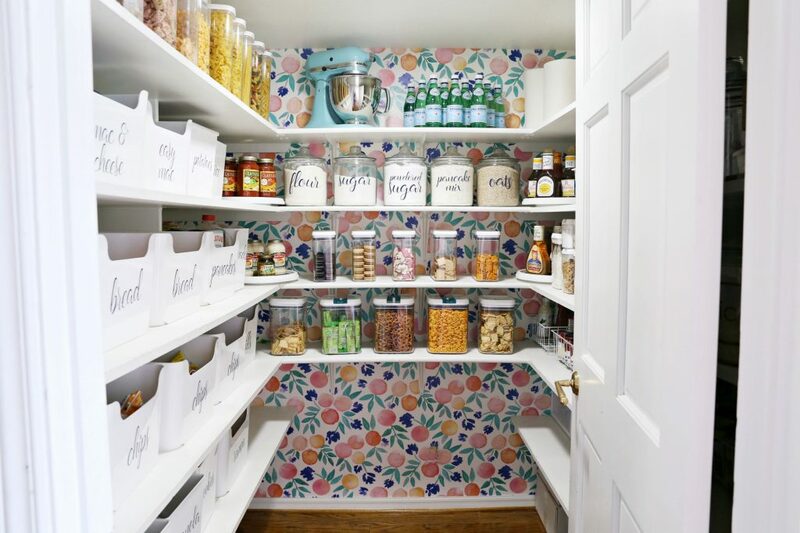 I love this pantry! How did you create those fabulous labels? When they installed the wallpaper, did they take the shelving off or apply around it? My soon-to-be pantry is almost identical and I’m just curious what the easiest way will be! Love it! 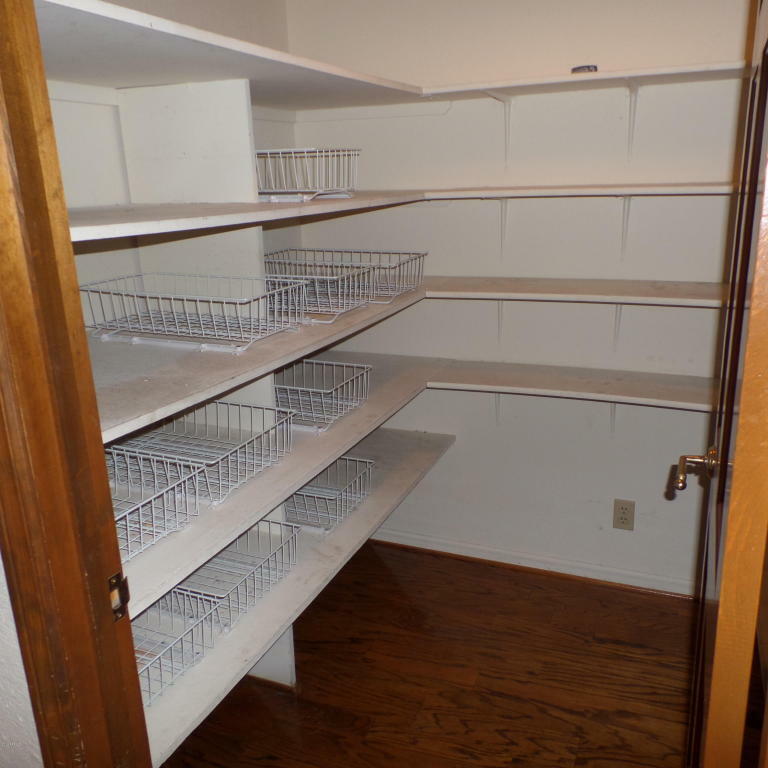 Working on planning out a new pantry and wondering the depth of your shelves that the heights between they shelves? Gorgeous!! I use a piece of clear packing tape on the back of my containers & a dry erase marker to indicate cooking instructions / expiration dates. If/when the info changes I can easily take off the tape and start over. What is the font you use? This is the most stunning pantry I’ve ever seen. You mentioned you had someone else come in and do the wall paper for you- did they have to take the shelves off completely and then put them back up? Wondering how doable this would be. Another tip that I have heard of to remove permanent marker is to write over the permanent marker using a dry erase marker. Should come right off. This looks amazing! I love the color of your kitchen aid matches the wallpaper 🙂 how on earth did you get it on and off the top shelf? I had to put mine on the counter and it stays put – that thing is a beast! LOL! I use my Bosch mixer for most recipes so I don’t get it down often. If I do, I use my step stool that is under the bottom shelf. Thanks! Can you tell me where you got the bins that are straight up like your Snacks bin? The pluggis are all so big! You show these smaller bins that don’t the front that dips down and I am on the hunt!! I hit Ikea today and bought them out of the large Pluggis!!! Thanks for always sharing. You girls are such an inspiration! What a gorgeous pantry! I recently decluttered my pantry and when I looked for ways to store it all, I stumbled on this post. So grateful for your ideas!! Can I ask what font you used for your labels? I would love to recreate them for my jars. Thank you!